Best Wedding Photographers in Ahmedabad Known for Their Stunning Captures! Ahmedabad is the city known to observe a wide range of festivals. With as much colour and extravagance each festival is celebrated, weddings too witness similar splendor. Helping couples preserve all the magnificence, fun glimpses and unnoticed emotions of their wedding day, the city is has several professional wedding photographers who capture not just photos, but piece of art that tell a story for many years to come. To make it super easy for you to find the best wedding photographers in Ahmedabad, we’ve compiled a list of our favourites whose work have made us go from ‘WOW’ to ‘OMG’. Redefining wedding photos with their unique approach to this art, each of these wedding photographers pay a lot of attention to fine details and bring to the table stunning captures that have a lasting impression. Check out their portfolio and book them right away. Led by Shradha Rathi, DreamGrapher is a collaborated team of candid and traditional wedding photographers in Ahmedabad, as well as cinematographers and videographers. Based in Edmonton, Canada and Ahmedabad, India, DreamGrapher undertakes destination wedding assignments worldwide. Their style is a mix of photo journalistic and candid with a touch of glam. Dreamgraphers approach each shoot with enthusiasm, poise and style making the tedious wedding photography process a fun element for the couples. A graphic designer who chose to study photography, Mansi Siddhpura today is one of the best wedding photographers in Ahmedabad known for capturing the moods of people than occasions. From pre-wedding shoots, candid photography to traditional wedding photography, she, along with her team captures all the rituals, colours, love and laughter in its true form, making your wedding memories cherishable for a lifetime. Marketer by profession and photographer by preference next on our list we have Varun’s Click, spearheaded by Varun Shah. Known for capturing what he feels rather than what the world sees, makes him one of the most preferable wedding photographers in Ahmedabad. In addition to wedding photography, Varun’s Click also specializes in cinematography, pre-wedding shoots, engagements, event photography, lifestyle, candid shots, couples, fashion, architecture and more. This 5 year old professional wedding photography services company in Ahmedabad is run by Radhika Pandit. Known for capturing moments that often go unnoticed, her team’s click provides an element of surprise in your wedding album. 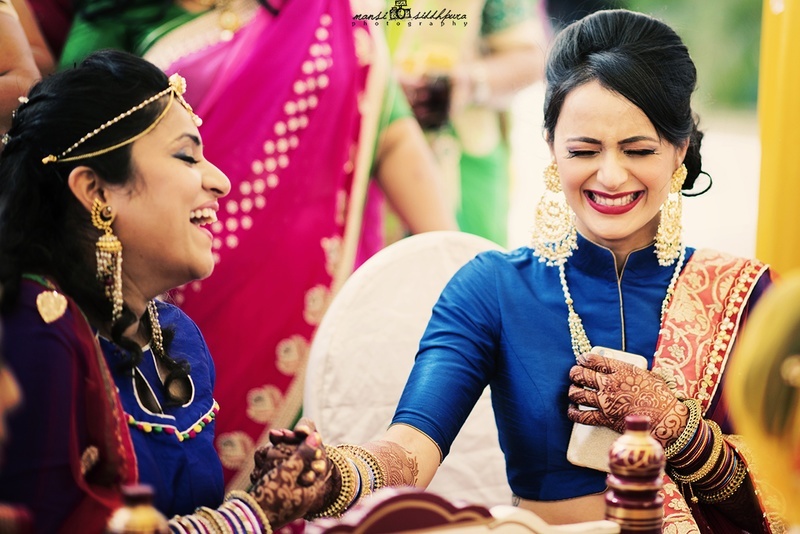 Based in Paldi, Ahmedabad, Serendipitous Smiles can travel anywhere across the world to capture your wedding moments. Should you have any customized photography requirements, Radhika Pandit and her team undertakes such requirements too. Nikon awarded cinematographer and candid photographer, Sandeep Gadhvi is a computer engineer turned wedding photographer in Ahmedabad helping people through his creative art immortalize their memories. Known for capturing the essence of a couple’s love tale, as well as extreme emotions of joy, love and celebration, his photojournalistic and candid style of shooting provides you with images that will make you submerge in the moment everytime you look at the images. With just 3 years of industry experience, KP Photography headed by Kailash Prajapati is one of the leading wedding photographers in Ahmedabad. They are a team of professionally trained photographers each possessing different styles that guarantee a variety of creative shots. KP Photography specializes in contemporary, journalism, portraiture, cultural, candid, artistic, natural, classic, vintage, black and white, conceptual, analog, underwater and destination wedding photography. Founder of Back Bencher Photography, Nikita Wankhede describes photography as life in déjà vu. She believes nothing beats the nostalgic feeling of reviving what is dead through classic photographs. Capturing perfectly emotions of the bride and all the pomp at weddings in her own unique way, her clicks make your relive your precious moments. Check out more such amazing wedding photogrpahers in Ahmedabad here.